Natália came to Sweden with her husband just a couple of weeks ago. 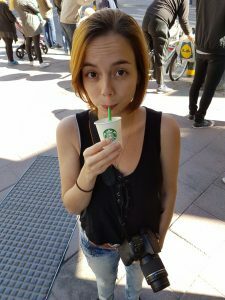 She is a journalist and content producer from Brazil and has also recently joined the Newbie Volunteer Group. We are very happy to have her on board and wish her the best here in Sweden. She shares her story and thoughts on how she ended up in Sweden. I like to say that I parachuted in to Sweden because everything was very fast, like ”3, 2, 1, jump!” My fiancé Arthur and I were enjoying our first months living together in Brazil. Life was good, we had our jobs, friends and family. We couldn’t ask for more. Then, one day, a friend of his told him about living in Sweden and encouraged him to apply for some job openings in Stockholm. It wasn’t that we wanted to live abroad very badly but we thought that it was worth a shot. And it happened! Arthur received an offer and we decided to go for this adventure. In one month we quit our jobs, got married, and (jump!) moved. It was crazy, but here we are, hoping to enjoy and learn a lot from this awesome experience. I didn’t come to Sweden with a job, so in the beginning it was very difficult for me to be at home all day “doing nothing”. But, I was lucky to find support from some Brazilian friends who have lived here for a while and from the company that my husband works for, as well. They helped with information and soon I started looking for job openings, university courses, volunteering, and so on. All of that helped me find new perspectives and goals. I did struggle a bit in the first week, when it was still cold (I hope to survive the real winter) and I was shy and insecure about speaking English. There are many things! I love the care that swedes have with nature. There are beautiful flowers and green areas all over the city. There is art everywhere, delicious coffees and nice pubs where you can meet with friends. Also, there are some things that make life easier, such the public transport system and the fact that everybody speaks English. What do you like about the Swedes? I still don’t know many Swedes, but juding by the few opportunities I’ve had to talk to them, I’d say it is the hospitality. Swedish people are always willing to help you, to be nice to you. They are what we call in Brazil ”gente boa”. What is your favourite Swedish word? What do you find strange about Swedes? I find it kind of strange the way that some Swedes dress, but in a good way – it is authentic. What do you miss the most from Brazil? Pão de queijo. It’s a traditional Brazilian dish from a wonderful region called Minas Gerais. It’s basically a homemade cheese bread. The best in the world! Hummm…. (Sorry, mom, I miss you too). What is confusing about Swedish culture? Swedish people are so polite that they stop the car for you to cross the street even when the pedestrian crossing lights are red. But, wait… it is confusing, right? Do you have any advice for a Newbie? Do not take too long to look for support to settle in the country – and there is a lot of support there. Sweden has a lot of structure for immigrants; you will find lot of information on the Internet, at government agencies, in social media communities, and so on. You are offered all the tools you need to achieve your professional and personal goals in Sweden. You just have to go for it. Wan to share any anecdotes about your first time here? An expat taxi driver told me as soon as I arrived in Sweden: “warm country, warm people; cold country, cold people”. The next day, my husband and I went out to visit some apartments for rent. Surprisingly, the (Swedish) person who received us, Anne, was joyful and had this great sense of humor. When we said goodbye she asked if she could hug us (so cute!). And I felt like… “Come on! I am the Brazilian here, I am the one who should have asked you that!”. So, yes, stereotypes are only that: stereotypes.